Published in the North Island Gazette June 4, 2015. The upcoming television show Alone, filmed in Quatsino Sound, is reminiscent of a real life survivor event that happened in 1939. In December of that year a fish packer called the Great Northern No. 5 was travelling in the area off Estevan Point, just North of Clayquot Sound, when it was disabled in a storm. The packer dropped its skiff, and then without a radio to make a mayday call, drifted north for two days. The ship's engineer, Ted Barnard, was swept overboard and perished, and the boat was smashed to pieces. The remaining two sailors, Captain George W. Skinner and his son Hugh Skinner, managed to stay afloat clinging to pieces of the cabin of the ship. 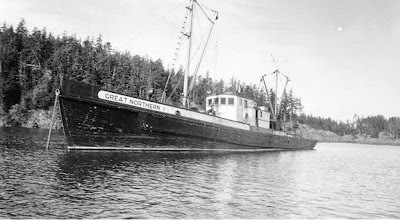 This photo is reportedly the original Great Northern No. 5. In the 1950s a new Great Northern No. 5 was built and fished until about the year 2000. Photo Bob Koskela. Father and son finally washed onto the rocky beach in the area around Lawn Point. Unfortunately a search which had been launched focused on the area south of Brooks Peninsula. George Skinner was weak and injured, and Hugh stayed with him for two days trying to find food and to make a simple shelter. Eventually Hugh decided to try to get back to civilization, and set out hiking the beach in a northerly direction, leaving his father lying in the brush near the beach. Hugh hiked for five days before he was finally spotted by a Ginger Coote Airways plane which was a part of the search for the missing Great Northern No. 5 that had been expanded to include Quatsino Sound. The float plane was unable to pick up Hugh, but did land in Winter Harbour, where a fisherman agreed to take his boat out to pick up the lost sailor. After he was rescued he was flown to the hospital and eventually transported to Vancouver, where he had to have two toes amputated. When Hugh was located he told the searchers where he had left his father, and searchers enlisted the help of a number of trapper/guides to scour the shoreline. Unfortunately the weather at the mouth of Quatsino Sound was too rough for the searchers to be taken to the location by boat, and they had to hike into the area. It took them three days just to get the spot where Hugh had been found. On January 4, 1940, twenty one days after Hugh had left him lying in the bush, George Skinner was found by the searchers. He was barely alive, and had lost a significant amount of weight. He had survived by sucking water from moss within reach of the spot where he lay. It had rained every day of his ordeal. The searchers sent up a signal and a plane dropped supplies for the victim and his rescuers. It was three more days before the weather calmed down enough for a boat to get in to rescue them from the secluded beach. George was immediately taken to the hospital in Port Alice via a sister ship to his own, the Great Northern No. 1, owned by the Francis Millerd and Company, and then transferred to Vancouver suffering from "exposure, starvation, and contusions generally." Photo from West Coast Fisherman. 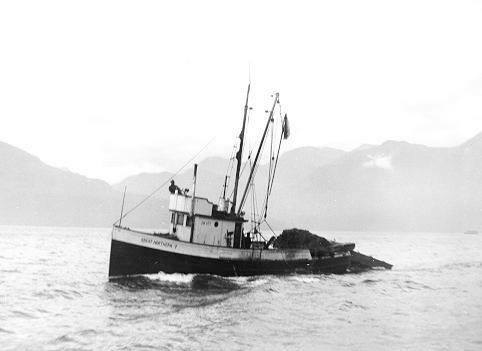 Captain Skinner was reportedly transferred from Winter Harbour to Port Alice on the Great Northern No. 1. Corporal Howe of Alert Bay, Constable Winegarden of Zeballos, and Constable Lockwood of Port Alice all received commendations for their role in rescuing the lost men. In part, the commendation read: "Hampered by winter gales, and working on an extremely dangerous coast, the efforts of Corporal Howe and Constables Winegarden and Lockwood were worthy of the best traditions of the Force." Both George and Hugh Skinner returned to the fishing industry, and fished along the coast for many years. Nicolson, George. Vancouver Island's West Coast: 1762-1962. Morriss Printing Co. Ltd. p. 261-263. I'm going to deviate from my normal history columns to say a quick word about my home on Northern Vancouver Island for those of you who may stumble upon this blog because you were searching out some information on a place to go camping or fishing. When I first moved to the North Island in 2001 I was interested in local history and, apart from a couple of books which referenced Cape Scott (but were out of print), Sointula, or family history stories from Port Hardy, I found there was very little accessible information. The more I looked into the history, the more fascinated I became. The first European settlement was on the North Island's West Coast, at Friendly Cove, and that small settlement almost caused a war between Spain and England. When trading started in earnest the power and ceremony of North Island First Nations was legendary, and led to federal policies in Canada which banned one of the most prolific cultural practices by local First Nations, the potlatch. When Europeans arrived on Vancouver Island, they first traded by ship in areas like Shushartie Bay. Fort Rupert, in the greater Port Hardy area, is the second longest settlement of Europeans on Vancouver Island, behind only Fort Victoria. Many of the families who live on the North Island today can count local First Nations and early settlers to the area as their relatives. It has been overwhelming to see how many North Island families alone have descended from the Hunt family, who purchased Fort Rupert when it was divested by the Hudson's Bay Company. As an amateur historian, cobbling together information from a variety of sources (government records, articles, books, personal interviews, archives, etc,) to tell the history of this area is a humbling experience, when to many of my neighbours the history of the North Island is their story. Publishing an article in the North Island Gazette, preparing a presentation for the local museum, or chatting with an old timer have always worried me. I don't want to get something wrong and misrepresent this area and its people. I am gratified to say, that after more then ten years of information collecting, muddling through, and voracious reading, I am still gratified every time a local old-timer approaches me in the Post Office and thanks me for a recent article. I am so pleased to live on the North Island and to have the honour of the trust of local people to help collect information about the truly incredible history of this amazing place.